Being the most important process involved in SEO, link building – only if done the right way – can improve your search engine rankings, greatly. But unfortunately, many webmasters don’t get positive results despite having expended lots of time and effort on ethical link building. Are you getting frustrated because your efforts aren’t paying off? Even if you’ve created lots of links, you won’t get any meaningful results if they’re all coming from sites with a higher page authority. These are low-quality links which will be of very little or no help to your SEO campaign. So, get your links from sites with a moderate or high authority. Your link building efforts will be productive if you get links from sites with high Page & domain authority. Remember that the higher the page rank of a site, the higher the quality of the link you’ll get from it. Before creating links from any site, check its DA & PA on open site explorer from Moz along with Alexa ranking on any page rank checker available online. Because links from high authority sites are very weighty, webmasters and bloggers spare no chances of getting them. So, they leave comments on as many as possible high authority sites, with links to their blogs or websites. This, ordinarily, would’ve boosted their SEO rankings greatly. But unfortunately, links from many high authority sites have the “nofollow” attribute attached to them and, therefore, are useless for SEO purposes – though they can help drive more traffic to your blog. To avoid wasting your time, check if any site has the “nofollow” attribute by viewing the HTML page source. To locate this attribute tag, use the “find” command and type “nofollow” in the column. If you find the tag within the HTML code for the page, it means links from that site won’t help your SEO efforts. Most bloggers commit this mistake. While creating links to your site on unrelated blogs won’t hurt if you don’t have SEO in mind, doing the same in the name of link building won’t be productive. It’s waste of time when you create links from a travel blog to your health blog, or from a pet care blog to your fashion blog. So, for your link building efforts to deliver results, get links only from relevant, related blogs or sites. The more the number of outgoing links on a page, the lower the quality of each. This explains why links created via blog commenting may not be good enough for SEO, especially when hundreds of comments are posted on the same page. Similar is when you have your link on another site’s “links” page – on which hundreds of links are listed. To get high-quality links, create links only on pages with few outbound links. A link on a page with just three outbound links outweighs that placed on a page with about 20. 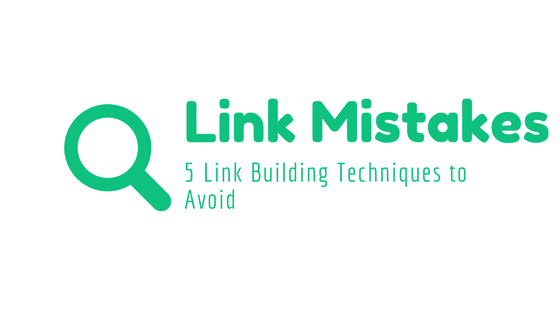 Now, you’ve discovered 5 common link building mistakes that leave most bloggers and webmasters frustrated. Have you been committing any of them? Now, you can correct yourself, and you’ll start getting the results you wanted. And if you’re just planning on starting your own SEO campaign, avoid these mistakes, and you’ll get positive results, quickly. Do you think there are other reasons not mentioned why webmasters and bloggers don’t get results from their link building campaigns? Please share your views in the comments section. If you did, then share with others and help them succeed too. Remember that, like you, many others need helpful tips like these to succeed. So, by sharing this post, you’ll be helping them, greatly. Even if you’ve avoided unethical like paid linking, link tribes, reciprocal linking, link spamming, etc., link building techniques here are 5 possible reasons why link building isn’t still working for you, and the Link Building Techniques to Avoid.